Before the health Benefits of the Mediterranean diet were well-known, there was probably no single food more emblematic of Mediterranean cuisine than the globe artichoke. And indeed, artichokes contain fructans, such as inulin; cynarin, which appears to help lower cholesterol and protect liver cells; and luteolin, an antioxidant that may also be involved in healthy carbohydrate metabolism. The edible part of the artichoke is the flower bud. The feathery part known as the �choke� is the immature flower. If it is allowed to bloom, the flower resembles a thistle, with a purple feathery top. Artichoke hearts are well worth the effort of nibbling away the leaves and peeling back the choke, for they are very rich in antioxidants. A cup of artichoke hearts has as high an Oxygen Radical Absorption Capacity (ORAC) rating as a cup of blackberries. Artichokes are a good source of the minerals magnesium, chromium, manganese, and potassium, as well as vitamins A and C, folic acid, niacin, riboflavin, thiamine, and biotin. They also provide dietary fiber. One medium boiled artichoke provides 150 calories, 33.5 g carbohydrate, 10.4 g protein, 0.5 g fat, 16.2 g dietary fiber, 531 IU vitamin A, 30 mg vitamin C, 3 mg niacin, 153 mcg folic acid, 1062 mg potassium, 285 mg sodium, 258 mg phosphorus, 135 mg calcium, 3.87 mg iron, 180 mg magnesium, and 1.47 mg zinc. Although there are several kinds of beans that are black, the black beans most widely used in American cuisine are those that are sometimes called turtle beans. Their dark color indicates a high concentration of anthocyanins, flavonoids known for their antioxidant effect. A half-cup serving of black beans has an ORAC score similar to that of plums, cranberries, grapes, and apples. Black beans, like most other beans, are rich in fiber, protein, and minerals. They are also an especially good source of molybdenum. One-half cup of boiled black beans provides 113.5 calories, 20.4 g carbohydrate, 7.6 g protein, 0.5 g fat, 7.5 g dietary fiber, 5 IU vitamin A, 128 mcg folic acid, 305.5 mg potassium, 1 mg sodium, 120.5 mg phosphorus, 23 mg calcium, 1.8 mg iron, 60 mg magnesium, and 0.96 mg zinc. Butternut squash is another winter squash. It has a dense, smooth, orangey-colored flesh, evidence of its rich supply of carotenoids. 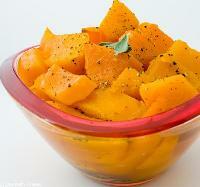 Indeed, half a cup of baked butternut squash provides 9,368 mcg of beta-carotene. It is high in fiber; in the vitamins A, B6, C, and folate; and in the minerals manganese, magnesium, and potassium. Butternut squash is a package of antioxidants and anti-inflammatories�good for your heart, metabolism, and immune system. Its sweet taste and high fiber make it a filling and sustaining addition to fall and winter meals. One-half cup of baked butternut squash provides 41 calories, 10.7 g carbohydrate, 0.9 g protein, 0.1 g fat, 2.87 g dietary fiber, 7141 IU vitamin A, 15 mg vitamin C, 1 mg niacin, 20 mcg folic acid, 290 mg potassium, 4 mg sodium, 28 mg phosphorus, 42 mg calcium, and 30 mg magnesium. Corn plays two important roles: It is both a grain and a vegetable. Although some heirloom species can serve as a vegetable when harvested young (at the �milk� stage) and also serve as a grain when allowed to ripen further and dried, most of the corn we eat today has been bred for one use or the other. The sweet corn we eat as a vegetable, either in kernels or on the cob, has a relatively high sugar content, which helps it retain its sweet taste even if it has to travel far from the field. This corn is a good source of B vitamins, including thiamine, pantothenic acid, and folates; vitamins A, C, and E; and the minerals magnesium and phosphorus. It is also a relatively good source of some amino acids, though it is not a complete protein. The word �corn� originally meant any type of grain, and in England and many other parts of the world, it still does. In those settings, the word �maize� is used for what we in the United States call �corn.� When English visitors first arrived in North America, they called the grain the Native Americans grew �Indian corn.� In the United States, this term eventually shortened to �corn,� the term in general use today. Increasingly, as people rediscover the more colorful heirloom varieties, the term �Indian corn� has been used to apply to them. Since many of the antioxidant and anti-inflammatory phytochemicals in foods are found in their pigments (anthocyanins in blue and purple foods, lycopenes in red ones), corn�s various colors provide intriguing nutritional possibilities. The common yellow corns are rich in carotenes, but red, pink, black, white, and blue corn varieties may be found to have different �secret weapons� to benefit health. Some types of corn even have different colored kernels on the same ears. Yellow sweet corn is an excellent source of lutein, a nutrient that is also found in the retina and that may play a role in reducing the risk of age-related macular degeneration. One-half cup of cooked corn provides 89 calories, 20.6 g carbohydrate, 2.7 g protein, 1 g fat, 2.3 g dietary fiber, 178 IU vitamin A, 5 mg vitamin C, 1.3 mg niacin, 38 mcg folic acid, 204 mg potassium, 14 mg sodium, 84 mg phosphorus, 2 mg calcium, and 26 mg magnesium. Garbanzo beans are a high-protein staple in many parts of the world, as the many names for them�including chickpea, ceci bean, and bengal gram�attest. In addition to providing almost a third of the daily recommendation for protein, a cup of chickpeas provides about a third of the fiber, too. They are a good source of the minerals phosphorus, calcium, magnesium, iron, and zinc, and one cup provides 84.5% of the daily value for the trace mineral manganese. Garbanzos are also a significant source of folate, vital to circulatory and heart health. Garbanzo beans contain saponins, some of which may act as antioxidants. 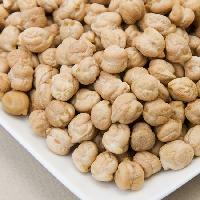 Because they are such a good source of soluble fiber, garbanzo beans help regulate blood sugar and lower cholesterol. The fiber and protein combination means Carbohydrates: Starchy Vegetables 77 that garbanzos will keep you feeling full for a long time. They can be balanced with a whole grain to provide a more complete, high quality protein. Although very few cases have been reported in North America, in countries where garbanzo beans form a significant part of the cuisine, such as India, allergies to them are relatively common, and the reactions can be severe or even life threatening. Like many other dried legumes, garbanzos also are moderately high in oxalates, and people with a history of kidney stones or vulvar pain may wish to limit the amount of garbanzo beans they eat. One-half cup of cooked garbanzo beans provides 134.5 calories, 22.5 g carbohydrate, 7.3 g protein, 2.1 g fat, 6.3 g dietary fiber, 22 IU vitamin A, 1 mg vitamin C, 141 mcg folic acid, 238.5 mg potassium, 5.5 mg sodium, 138 mg phosphorus, 40 mg calcium, 2.37 mg iron, 39.5 mg magnesium, 1.25 mg zinc, and 0.84 mg manganese. Peas are another food that is available in two forms�fresh or frozen, and dried. Fresh or frozen green peas are a great source of vitamin C and thiamine, as well as a good source of vitamin B6, niacin, and folate. They are also a good source of the minerals iron, zinc, and phosphorus, and provide a reasonable amount of both protein and fiber. Green peas are also a very good source of lutein, which may help preserve eyesight and prevent the thickening of arterial walls. Combined with the B vitamins and fiber, this makes peas a good choice for keeping the heart and circulatory system healthy. Another type of fresh pea has edible pods�snow peas and sugar snap peas. These have much the same nutrient profile as green peas, with the pods providing somewhat more vitamin C and potassium. Dried peas become an even more important source of protein, while keeping much of their iron and folate value. A cup of dried split peas has more than 48 grams of protein and 50 grams of dietary fiber, but it will have lost its lutein and most of its vitamin C.
One-half cup of cooked frozen peas provides 62 calories, 11.4 g carbohydrate, 4.1 g protein, 0.2 g fat, 4.4 g dietary fiber, 534 IU vitamin A, 8 mg vitamin C, 1.2 mg niacin, 47 mcg folic acid, 134 mg potassium, 70 mg sodium, 72 mg phosphorus, 19 mg calcium, 1.26 mg iron, and 23 mg magnesium. Although long prized for their high protein and fiber content, kidney beans have gained new respect due to their high antioxidant content. In a study by the USDA, kidney beans showed nearly as much antioxidant capacity as wild blueberries. 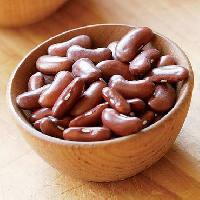 Kidney beans are also a good source of folate, magnesium, iron, zinc, and molybdenum. Because they are high in fiber and protein, they help to stabilize blood sugar. Their panel of minerals, combined with the fiber, Benefits the heart and circulation. And the potential value of antioxidants in preventing all kinds of age-related diseases, from heart disease to Alzheimer�s, gives these beans a place on any list of SuperFoods. One-half cup of cooked kidney beans provides 112.5 calories, 20.2 g carbohydrate, 7.7 g protein, 0.45 g fat, 6.5 g dietary fiber, 114.5 mcg folic acid, 356.5 mg potassium, 2 mg sodium, 125.5 mg phosphorus, 25 mg calcium, 2.6 mg iron, 40 mg magnesium, 0.95 mg zinc, and 0.42 mg manganese. Lentils are among the legumes that are highest in protein, though they are low in two essential amino acids and need to be balanced by grains to provide complete protein. They look like split peas�the result of growing two in a pod, pre-split by nature. In addition to providing protein and fiber, lentils are a good source of thiamine and other B vitamins, potassium, and iron. Because much of their fiber is soluble, they are helpful in stabilizing blood sugar and in lowering cholesterol. One-half cup of cooked lentils provides 115 calories, 20 g carbohydrate, 9 g protein, 0.4 g fat, 7.8 g dietary fiber, 8 IU vitamin A, 1.5 mg vitamin C, 1 mg niacin, 0.63 mg pantothenic acid, 179 mcg folic acid, 365.5 mg potassium, 2 mg sodium, 178 mg phosphorus, 19 mg calcium, 3.3 mg iron, 35.5 mg magnesium, 1.25 mg zinc, and 0.49 mg manganese. Lima beans, a great source of fiber and protein, are another legume that is eaten in both fresh and dried forms. A cup of cooked fresh lima beans provides 11.6 grams of protein and 9 grams of fiber, while a cup of cooked dried limas provides 14.7 grams of protein and 13.2 grams of fiber. Lima beans are a good source of several minerals, including copper, iron, magnesium, manganese, molybdenum, phosphorus, and potassium, as well as the B vitamins folate and thiamine. Fresh limas also provide some vitamin A, vitamin C, and beta-carotene. The magnesium and potassium help regulate blood pressure. Along with the folate and fiber, these beans are good for your heart. One caution: Raw lima beans contain linamarin, a compound that can break down into the poison hydrogen cyanide in the human digestive tract. Cooking lima beans neutralizes the risk, and the varieties used for food are generally low in the substance. Linamarin may also contribute to glucose intolerance and diabetes, but studies have not been definitive. 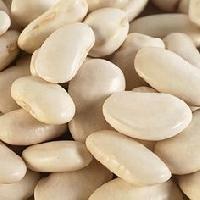 Lima beans also contain protease inhibitors, which frustrate the development of cancerous cells. One-half cup of cooked lima beans provides 108 calories, 19.7 g carbohydrate, 7.4 g protein, 0.35 g fat, 6.6 g dietary fiber, 78 mcg folic acid, 477.5 mg potassium, 2 mg sodium, 104.5 mg phosphorus, 16 mg calcium, 2.2 mg iron, 40.5 mg magnesium, 0.9 mg zinc, and 0.22 mg copper. Navy beans, also known as small white beans and pea beans, are among the most versatile beans to cook with. High in protein, they are also very high in fiber�even among the dried legumes. A cup of cooked navy beans provides 19 grams of dietary fiber! Navy beans are a very good source of folate and manganese and a good source of thiamine, as well as the minerals phosphorus, copper, magnesium, and iron. One-half cup of cooked navy beans provides 129 calories, 24 g carbohydrate, 7.9 g protein, 0.5 g fat, 5.8 g dietary fiber, 2 IU vitamin A, 1 mg vitamin C, 127.5 mcg folic acid, 335 mg potassium, 1 mg sodium, 143 mg phosphorus, 63.5 mg calcium, 2.25 mg iron, 53.5 mg magnesium, 0.96 mg zinc, and 0.51 mg manganese.